The North West region of Unison council met on 4 February in Huyton, Knowsley. The meeting discussed and agreed a number of progressive motions. 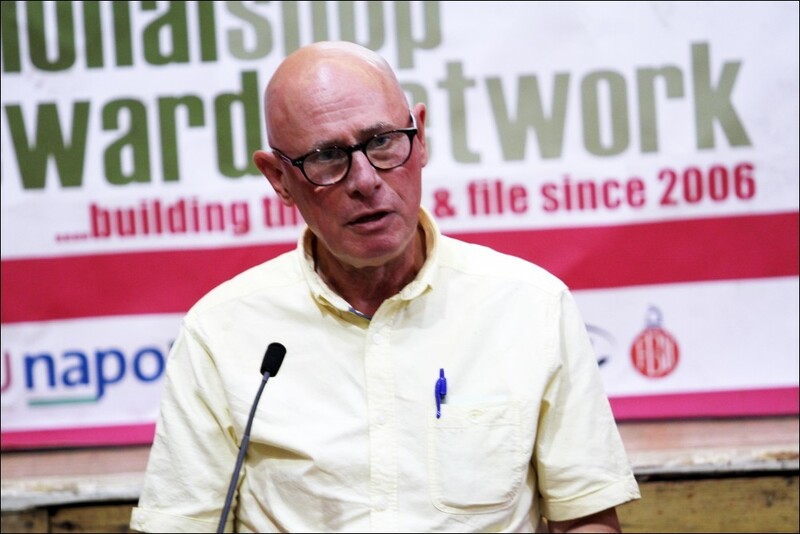 It was the last regional council meeting for Socialist Party member Roger Bannister who is due to retire from work. A number of verbal tributes were made to Roger from both Regional Secretary Kevan Nelson, and Paula Barker, the regional convenor. They both gave examples of how during the last 40 years Roger has been a leader at branch, regional and national level on behalf of Unison members. A standing ovation from the whole meeting greeted Roger when he came to the platform to accept his gifts from his union. Roger gave a powerful and emotional speech which was greeted by another standing ovation from the whole meeting. Jeff Bowe, the incoming branch secretary for Knowsley Unison, paid tribute to Roger the principled socialist. Roger led and won disputes in his branch, he always rolled his sleeves up and conducted the day-to-day case work alongside raising the banner of socialism within his trade union. Respect, comrade. The North West Ambulance Service has just been inspected and found to be "requiring improvement." The biggest worry is lack of staff, with the service carrying nearly 6% vacancies. Whistle-blowers have told the BBC that often so-called 'emergency medical technicians' are sent out instead of fully-trained paramedics. Now, to add to their woes - and our worries - the ambulance station in Rawtenstall, Lancashire has had its rent hiked by over 1,500%, from £1,300 to £19,945 a year. And their landlord is another part of the NHS! The rent at the ambulance station is controlled by the misnamed 'Community Health Partnerships', a company owned by the Department of Health, which sets up 'public-private partnerships' and manages the NHS estate. Russ McLean of East Lancashire Patient Voice commented: "It's diabolical that companies would seek to make money off the back of people seeking to provide life-saving services." Unable to afford the rent hike, the ambulance service is relocating to a police station in a nearby town. This is what financial pressures, privatisation and fragmentation are doing to the NHS - greedy landlords forcing the eviction of front-line services. A strike of agency workers working for Sri Lanka Telecom, demanding parity of pay and conditions with directly employed workers and permanency of employment, has been going on for more than a month. They have been camped outside the main building, but the employer has won a court injunction ordering them to move. In Britain, the Communication Workers Union has had a long-running dispute with BT over employing agency workers on permanent jobs for the last decade or so. The main provider of BT agency workers is the same - Manpower. The similarity of the two disputes shows how the bosses organise globally. Workers need to organise in the same fashion. Please send messages of support to srinathusp@gmail.com. I was very impressed and inspired by the theatre review of 'The Seven Acts of Mercy' in issue 932. I had seen an advert for the play and had wanted to see it but am unable to go to the Swan Theatre in Stratford-upon-Avon. I was hoping it might come to Huddersfield or Leeds later. I was so happy to read Mark Baker's review. I got out my art DVD on Caravaggio and saw the paintings for myself and I found one of my little books written by a priest friend of mine on The Seven Acts of Mercy. I had seen 'I, Daniel Blake' and was deeply moved by the film, so the reviewed play must be absolutely tremendous as described by Mark. Thank you for the opportunity to get a glimpse of the play through Mark's eye. Excellent review! I do hope many more people will be able to see this play, where "the voice of the dispossessed speaks loud and clear" with "the desire to rid the world of capitalist exploitation."